A shower or two around the area early, then partly cloudy overnight. Thunder possible. Low 53F. Winds light and variable. Chance of rain 30%..
A shower or two around the area early, then partly cloudy overnight. Thunder possible. Low 53F. Winds light and variable. Chance of rain 30%. The days of fine dining at Loew’s Ventana Resort ended rather abruptly a few years back with the closing of The Ventana Room. However, there remain lots of “fine” aspects at Ventana. The golf courses are perhaps the best-maintained public tracks in our area. The resort is in the finest of settings (tucked into the east foothills of the Santa Catalinas). And for those who venture east on Sundays, there is the very fine Sunday brunch. This combination of indoor and out food stations, comfortable dining spaces, and elaborate, outside grilling is unlike anything we’ve experienced here in the Old Pueblo. Brunch begins with a choice of beverage including complimentary bloody mary, mimosa, Champagne and draft beers. Then diners are set free to graze among the many quality offerings from the Ventana kitchens. By the way, the drinks keep coming throughout the meal. The seafood “island” usually includes oysters in the half shell on ice, good-sized shrimp (prepared two or three different ways) and steamed mussels. There’s plenty of cocktail sauce, freshly ground horseradish and lemon wedges to go along. Throughout the experience, breakfast items are also offered. Freshly made (and warm) waffles, sunrise meats, and made-to-order omelets are found at a separate station. Can’t forget the well-prepared Eggs Benedict either. The Ventana chefs also put together a variety of green salads and pasta dishes. Those are found at the station that includes thinly sliced deli cuts of mortadella, capicola and tasty salami. Look there for some interesting cheeses as well. Overall, the offerings are well balanced, enticing and palate pleasing. The food stations are placed strategically in and out. We have been there when most of the seating is filled; yet there are not long lines or significant waiting to reach the food. That does make for a buffet that is spread over a large area. So there is a bit of walking around between courses. The staff is very attentive and they efficiently refill beverages and clear plates for the next foray to the serving areas. The exterior portion of the space provides the scenic backdrop, additional seating, live rhythm and blues and a food preparation and serving area not to be missed. Draft beer is tapped nearby and several chefs keep the grill embers burning as they serve up several savory offerings. They provide slow-cooked pork, grilled chicken, steaks cooked to order, salmon filets and some very tasty and tender, back ribs. And there is even more to go along with that. 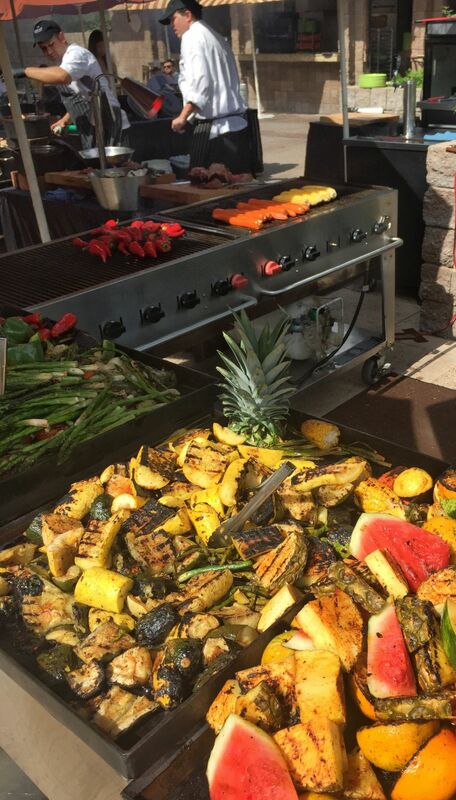 Restaurant quality smashed potatoes, grilled veggies and fruits, baked pinto beans are featured sides. Every time we brunch there we just can’t “do justice” to the dessert station. However, it is there for the taking! There is only so much room even for those tempting treats. Frequent trips to this venue are not on our dietary radar. However, we do look forward to it time and time again. The tab is steep at $42 per person. But for several years, the Canyon Café has been included on the Tucson Dining Card. So we can take advantage of this fabulous meal for half the going price. The Blues, Brews and Sunday Brunch is featured at the Canyon Café, Loew’s Ventana Resort on Kolb Road just a mile north of Sunrise. Details can be found at www.loewshotels.com/ventana. Reservations are recommended.